All this before July 24th?? 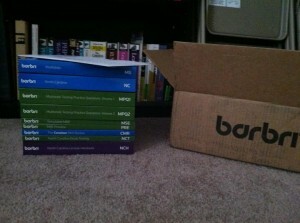 The pic on the right is what I came home to earlier today, courtesy of BarBri and the $$$$$ I parted with for them to help me pass the bar. That’s a total of 9 different books: an outline of the Multistate Bar Exam topics, an outline of the NC-specific topics, a mini-outlaw of the MBE, 2 massive books of multiple choice questions, a “Preview” book of multis, a “mock MBE” book of multis, a book of essay prompts, and the purple book full of fill-in-the-blank handouts for lectures. You can see the bookshelf behind for a size perspective. …so now we officially have a NC SPICE Facebook page and a NC SPICE Twitter feed! Did you know today was “Law Day”? There’s still a lot more I have to knock out before graduation so I can focus on bar prep, but things are slowly falling into place!